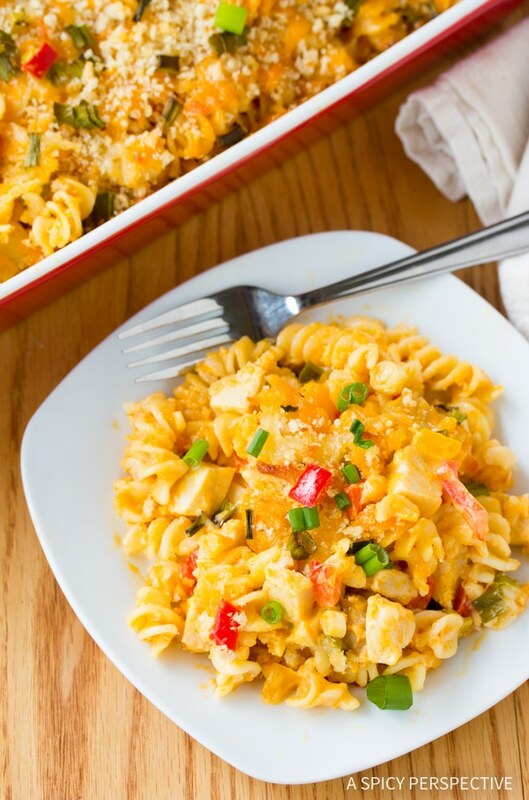 Quick and easy Buffalo Chicken Mac and Cheese, using whole grain pasta, scores winning points on the home front! A few years ago on Super Bowl Sunday our house was filled with eager friends and enticing food. We had wings and sliders, a variety of finger foods, and cakes, but the dish that seemed to get the most attention was a dip. Ahem… a dip that I did not make. The only item I did not make. I don’t mind being shown up. After tasting our friend Eric’s Buffalo Chicken Dip, my mind starting churning with inspiration. This dip would taste great with nearly anything, so why not use it as a springboard for other recipes? Like creamy buffalo chicken dip and pasta, for instance! 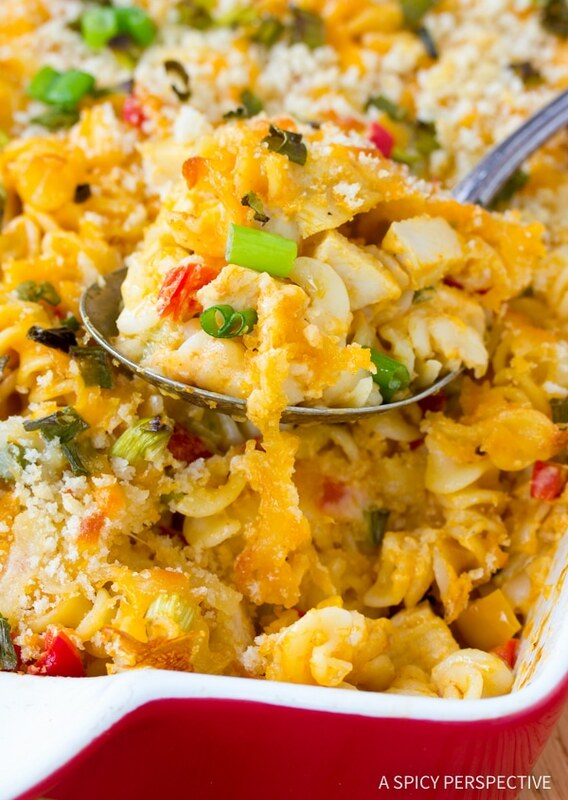 This Buffalo Chicken Mac and Cheese is incredible. INCREDIBLE. With tender chunks of chicken, bits of sweet bell pepper, fresh green onion, and a rich zippy cheese sauce, it is a true crowd-pleaser. Buffalo Chicken Mac and Cheese is so easy to prepare, you’ll be more than happy to whip it up when your family begs for it over and over! With a brick of cream cheese, store-bought hot wing sauce, and good-quality blue cheese dressing, you can make a truly amazing cheese sauce to pour over your pasta. You can also make a light version of Buffalo Chicken Mac and Cheese by adding low-fat cream cheese and reduced-calorie dressing. Bonus, Buffalo Chicken Mac and Cheese is a great way to use up leftover chicken. Is this your first time visiting A Spicy Perspective? Preheat the oven to 350 degrees F. Boil the pasta in salted water according to the package instructions. Drain and transfer to a 9 x 13 inch baking dish. 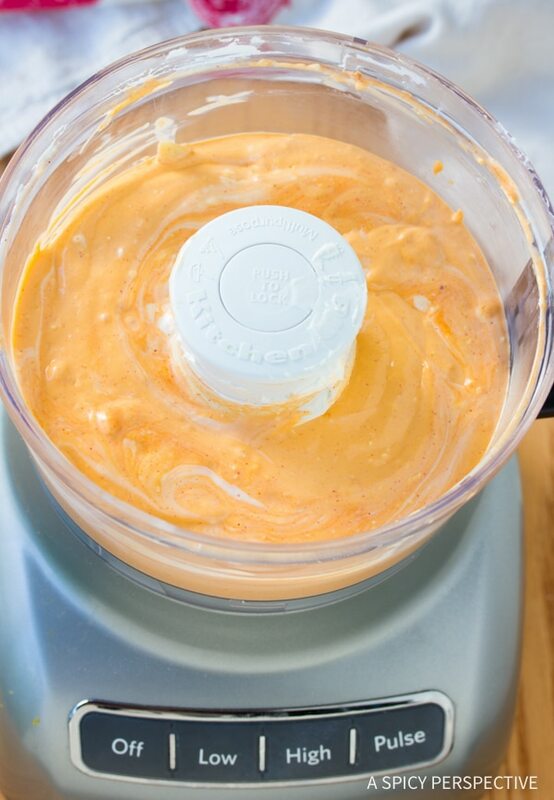 Place the garlic, cream cheese, blue cheese dressing and 1/2 cup hot wing sauce in a food processor. Puree until smooth, taste and add another 1/4 cup hot wing sauce if needed. Pour over the pasta and toss. Mix the remaining 3/4 cup cheese and the panko together. Sprinkle over the top of the pasta, then sprinkle with the remaining green onions. Bake until golden and bubbly, approximately 30-40 minutes. NOTES: If buying pre-shredded cheese, make sure to select one without fillers, that melts well. You can reduce the fat and calories by using low fat cream cheese, shredded cheese, and blue cheese dressing. Easy and simple recipes are the best! It just takes away all my enthusiasm when I see those loong and complex recipes! I made this last night. It was great! 4 people and the pan was gone. Your site it’s magic … Hear me ? MAGIC !!! Could ranch be substituted for blue cheese? This was not bad… I used cheaper blue cheese dressing because I never buy used blue cheese dressing and have no way to know what good kind is. It made the dish have a “plastic-y” flavor. Will follow directions and buy GOOD blue cheese next time, I’m assuming the more expensive stuff. Oh my gosh that picture with the cheese mixture being poured over the macaroni is just too much. Gahhh. Just wanted to say, I made this for dinner last night and it was FANTASTIC, the whole family loved it. Thanks for a great recipe ! Made this for the family tonight…we all enjoyed it and are having the second half for dinner tomorrow. Good stuff! Will be making this – this weekend! I am not a cook but found this recipe for Buffalo Chicken Mac and cheese and just wonder, is the buffalo sauce something you can buy premade or is it another recipe I need? This recipe was a total winner in our house! My never to admit picky-eater, gushed and that made me so happy! Delicious! Do you think ranch would work in place of the blue cheese? I’m not a fan of blue cheese, so I’d like to find a replacement, unless you don’t think the blue cheese dressing is that noticeable in the taste. This recipe looks too good to pas up! This looks amazing and I can’t wait to try it! I was wondering, however, about the Bleu Cheese dressing. We don’t care for it. Should I just omit it or substitute it with more cream cheese or something else? Thanks! Curious – for those who have made this, how spicy and blue cheesy is it? I’m asking because, while I LOVE the entire list of ingredients, I have a 4 and 6 year old who will not (especially if it’s too spicy). Has anyone made this for their children and gotten feedback? THANK YOU! Jennifer, MY kids love it, but they are accustomed to spice. You can add the hot wing sauce to taste if you like. Just wanted to let you know that I discovered this recipe through “Pinterest”. To be honest, I would much rather try recipes that people have actually made and commented on, rather than reading … “I must try”, or “looks yummy”. So, in saying that, anyone who really would like to “try it” or “must make” … then “DO IT” as I’m sure you won’t regret it. 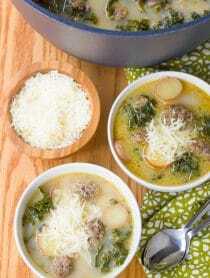 This recipe is very easy, economical, and taste very good. I have made this dish a few times and I have never been disappointed. Enjoy! Can’t wait to try this, but I was wondering could you substitute ranch for blue cheese? gahhh this sounds amazing! love the colors! 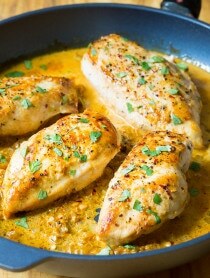 This looks wonderful and I would love to make it, but I don’t have a food processor, what is an alternative way that I could still make this dish? Thanks! Hi Kendra, You could whisk them together. Thank you for this wonderful recipe! I made this tonight and will be posting it on my blog. I was sure to link back to this page as well. Very tasty and a lot easier than I thought it would be. I would love to see more like this! Healthier and still tasting good? That’s my kind of pasta. Barilla has always made great pasta and this is just one more way they are the best. I like that it has more fiber than regular pasta but still tastes great. I like it’s healthier but still tasty! What do I love about Barilla whole grain? That we’re eating healthier without compromising on taste! I THINK THE STUFF TASTES GREAAAAT! Barilla whole grain pasta is great tasting!! This looks delicious. I’d love to win the Barilla sweepstakes! I love that Barilla has given us a healthier pasta, yet you would never notice a difference! What a great giveaway! Thanks for the opportunity. That recipe looks yummy too! I love that Barilla’s whole grain pasta still maintains the texture of traditional pasta while being a healthier alternative! I love the taste of Barilla Whole Grain, its a healthy good taste to pasta. I love the variety of noodles and quick cook time. Thanks for the review and giveaway. I actually like whole grain pasta more than the regular white kind because I prefer my pasta firm. Yum! I am a big fan of pasta of all shape and sizes. I like that they offer this whole grain… we all know how good that is for us! And by the way, this recipe sounds sooo good. I will have to try it. I like that its good for me and my kids cant tell the difference! thanks! I absolutely love the Barilla whole grain pasta! My husband loves pasta and using the whole grain lets me give him something nutritious without changing his favorite dishes. Plus, Barilla is awesome with putting out coupons and sometimes I can get it for free! I like that it’s made with 51% whole wheat, which makes it a healthier pasta option. I love Barilla pasta. Some whole grain brands taste gummy and tacky, but Barilla whole grain tastes just like their other high-quality pasta, only healthier! Oh no Max! I wonder what brand of wing sauce you used?!? I’ve made this with 3 different brands and it always turns out delicious. Very yummy looking. I’ll have to try this soon. I enjoy Barilla’s pasta because it is a healthy choice that tastes even better than the not-so-healthy pastas. I love that its not gritty and tastes good even though its very healthy. I’m familar with buffalo chicken dip, and cannot wait to make it into a pasta! It’s great to see a healthy, good tasting pasta like Barilla Whole Grain Pasta available. Incredible! I love Barilla because it is the only whole grain pasta our small town grocery store carries. I love the fact that it tastes slightly nutty and has lots of fiber. I love that it’s a better alternative that doesn’t sacrifice taste. I love Barilla Whole Grain Pasta because it tastes just like my traditional pasta! That literally made my mouth water! I like the convenience of pasta to get whole grains. barilla whole wheat pasta tastes good and is a healthy alternative. it’s a win win situation. Barilla Whole Wheat tastes, feels and looks better than regular pasta. I love the nutty taste to whole grain pasta. i like how healthy Barilla pasta is and how it tastes so good. I love Barilla whole wheat pasta and I definitely am going to have to try the shell shape! 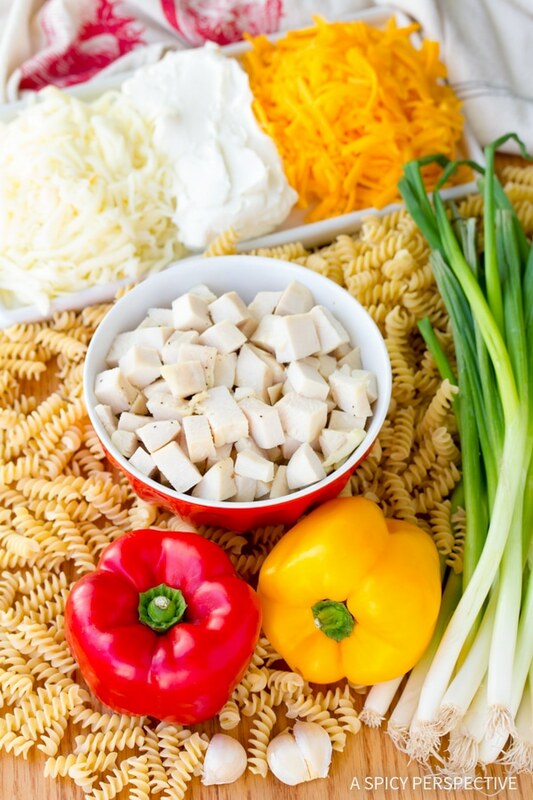 I love that Barilla Whole Grain pasta comes in so many different shapes–and tastes great too. That Buffalo Chicken Mac & Cheese looks fabulous! I saw it on Pinterest and had to come and check it out. I love that you can substitute the healthier whole grain pasta and still have a delicious comforting meal. your dish looks soooooooooooooooooooo yummy!!! I love the hearty texture and flavor! I love Buffalo Chicken Dip!! I just tasted this for the first time at a New Year’s Eve party. It was the crowd favorite. I can’t imagine how amazingly good the dip is mixed with bits of pepper and noodles. When we make pasta, we only use whole grain pasta. We like that Barilla makes a healthy product and offers it at an affordable price! I like the great taste of the Barilla whole grain pastas, they are the best I’ve tasted. Buffalo Chicken Mac and Cheese is what I make every year for Super Bowl! However, your version looks a lot easier to prepare which is always good when preparing for people to come over to your house. It’s crazy because Barilla Whole Grain Pasta is what I use in it (and whenever making any pasta dish to be honest) Love the fact that I can get in that whole grain in my pasta without it tasting too much like whole grain which the fam loves. I really do love Barilla Whole Grain…in fact, I’ve got a pantry full of the stuff! it doesn’t taste whole grain, meaning it doesn’t have a flavor that overpowers a dish. yea! thanks for this recipe, Spicy–looks like another sure-fire winner! I love all the Barilla pastas – they are always high quality! This is a family favorite and is, in fact, on the menu for a basketball team party this weekend! Teenage boys will inhale it! This mac & cheese sounds totally awesome with the hot wing sauce and bleu cheese dressing, nice! Thanks for the contest–variations of this recipe are popping up all over, so it must be really good. I even overheard my yoga instructor talking about a version that her sister-in-law made for Christmas. Your version is the best-sounding one I’ve seen! Ugh, yum. This looks so comforting and delicious. I don’t really like buffalo wings, but I love buffalo wing sauce so this is perfect for me. Love Barilla Pasta! The taste and texture of it is great. Not only is Barilla my go to sauce brand (when I just don’t have the time to make it on my own), but now that they offer this delicious whole grain pasta, they are definitely my go to pasta. It is so tasty and the texture is perfect, not like other whole grains which my kids have described as tasting “stale”. If my kids can’t tell a difference, then I’m a happy camper!!! I first tasted Barilla in Italy where I spent a month working with a friend many years ago, and I was hooked! I am thrilled that they also launched the whole grain version here is the US. That way I can take care of my family health while providing the best ever pasta dishes. I tend to use Mediterranean-inspired recipes. It’s a family tradition, just as Barilla is a family band. I love this whole grain pasta. It cooks up so well and tastes fantastic. I use it all the time (Tammie) Your recipe does look like a crowd pleaser! I am making a version of this tonight! Woohoo! Thanks for the inspiration Sommer! I love using Barilla Whole Grain Pasta because I have a hard time telling the difference. It’s nice to know I’m serving something comforting and healthy to my family. This dish looks so yummy!! I used Barilla whole wheat penne for Mac and Cheese cupcakes for my parents’ Christmas party. Yum! Love that I can enjoy a pasta product that is healthier for me! Yummy! We have incorporated Barilla’s Whole Grain pastas in our lives since we discovered my husband’s diabetes. Our daughter LOVES the taste and texture even better than the “white stuff”! Great recipe! I love whole grain pasta, if I could only convince my boyfriend of how wonderful it was…he’d really love the texture it lends! I am all about whole grain pasta–tossed with spinach pesto, blanched asparagus and cherry tomatoes, it’s pretty much heaven in a bowl. Question: What do you love about Barilla Whole Grain? – I love that it’s better for you than traditional pasta – lower in carbs too! After trying it, I actually was surprised to find that I preferred the taste and texture of whole grain pasta. Barilla, I think, has the best taste of the whole grain pastas I’ve tried. This recipe looks delicious, and I can’t wait to try it out! Barilla is the only pasta I use! The Safeway here,in Douglas,Wy., doesn’t carry the variety that Wal-Mart in Casper,Wy does,so the Whole Grain Pasta is the only one I buy! the taste is great and it seems to be more filling. I will be trying this recipe as my daughter loves spicy food! Thanks for posting it! 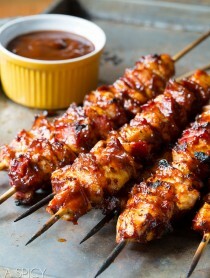 Soooo making this for dinner! And what I like about Barila is that all of their noodles taste good. No funny taste or weird texture! Sounds wonderful! I am thinking about it for tonight’s dinner. I liked you on Facebook, does that count? I love the bite to healthy whole wheat pasta, and actually choose it over the regular kind. Barilla is one of my favorites because of the subtle yet earthy flavor. I love the taste and love the texture of Barilla Whole Grain Pasta. Sooooo yummy and good for you too. This looks so good!! I love buffalo anything and this really sounds like a great, hearty meal. And I agree, barilla does a really nice job with their whole wheat pasta. Pinned! This mac ‘n cheese looks incredible! Love the suggestion for a lighter option. I’m a huge fan of barilla pasta. It just tastes better. Mmmm, mmm, big huge thumbs up for this. Everyone in our house loves buffalo chicken flavours and mac n cheese. Sommer my hubby would devour this!! THANKS!! Whole grains pasta has been found to protect you against cancer and childhood asthma! Plus I like the flavor! I love that it’s healthier! I love that it doesn’t taste that different from regular pasta! I love their whole wheat pasta. It definitely gives any dish a healthier form of pasta. I love the extra fiber. Sneaky! I feed my family whole grain pasta without any complaints. Love it! I love that Barllla whole grain pasta is nutritious and delicious – and it’s something my picky kids will eat it! My local grocery had a special last week – whole grain Barilla pasta was 10/$10 – so my pantry is very well stocked. YAY! I like the new healthy pasta! Pasta is no longer a gulity pleasure. I love it because the kids think they are eating regular pasta! No begging or bribing needed! I love whole grain pasta. It fills you up faster than regular pasta and the added nutrients make me feel good about what I am eating. I love the full flavor of barilla’s whole grain pasta. And I really can’t wait to try this recipe. I love that it doesn’t taste different! By the way, love The Spicy Perspective!! What I love about Barilla Whole Grain is that it is a great substitute for regular pasta. I can hardly tell the difference. Oh my word. watching that sauce pour over the pasta is amazing. I want it now. THIS is enough to make me wear giddy pants, I TELL YOU. I love that my kids will actually eat it because it’s not too grainy! This is the only pasta I buy. With the whole wheat version, it gives it a soft yet flavorful taste. I just used the fusillia pasta in a Butternut Squash, Black Bean and Fire-Roasted Tomato Sauce served over the pasta!! Topped with Toasted Pumpkin Seeds and Fresh Cilantro!! I already love Barilla’s regular pastas, so a whole grain pasta is even better! Wow, what kid would want a plate of this! 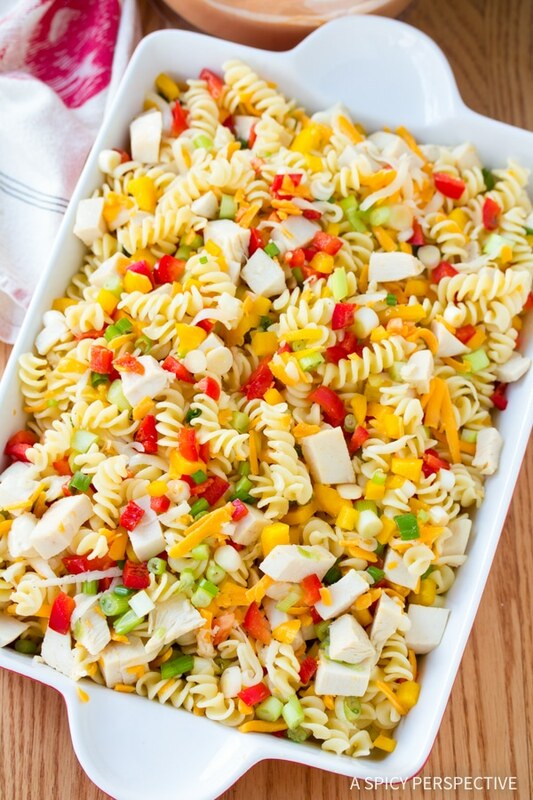 What a great recipe to get them to eat whole grain pasta. I serve Barilla whole grain pasta to my kids all the time – an easy way to get whole grains into their diet. Oooooooh! I REALLY want to try this! Sommer, this looks really, really good! I know my family would really go for this one. We use whole wheat pasta in all of our pasta dishes and have really grown to love the taste and texture. I could and would dive head first into this if it was in front of me right now! I love hoe Barilla wholle grain doesn’t necessarily “taste” healthy or significantly different from regular pasta! Amazing pasta! Love turning dips into dinner! wow looks so creamy!! Great dish. Wow! My husband would love this one! I love their whole grain pasta because it’s packed with fiber, but yet still tastes good! Oh, that buffalo chicken dip is SO good! 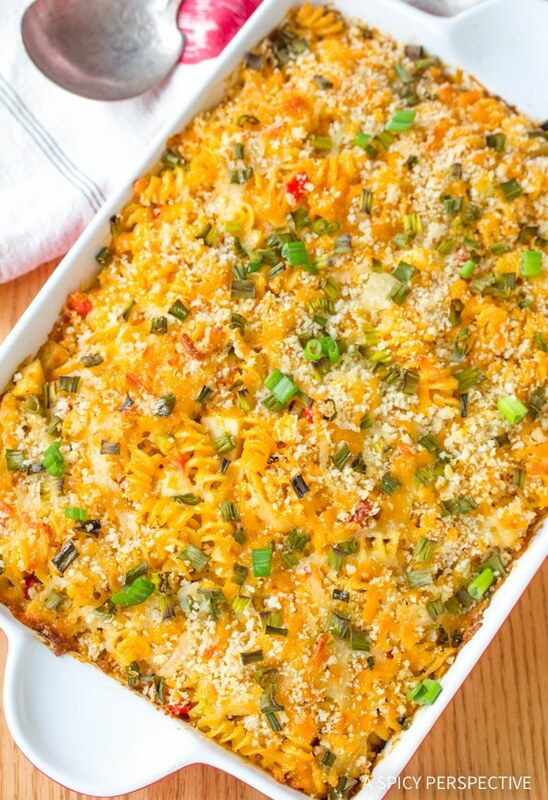 I’m glad you were able incorporate all the amazing flavors into a mac and cheese dish! YUM. And I really try to focus on whole grains so Barilla’s whole grain pasta is the best/most accessible option for my pasta dishes! I love the flavor of whole grain pastas! I love Barilla Whole Grain pasta because it has the best of both worlds (white and whole wheat worlds, that is). It has the smoothness of white pasta, but a nice hit of the nuttiness you get with whole grain pastas, too. I like it’s whole grain and also taste great. Kids approve as well! Holy spicy chicken—this looks great! What I love about Barilla Whole Grain pasta is that I know my family and I are getting some fiber in our diet and also that it doesn’t taste grainy. I love your recipe and I gotta give it a try soon. I’m also a big fan for Barilla Whole Grain pasta! Love that extra fiber and nutty flavor compared to regular pasta. Barilla is my favorite pasta!! It’s a $100 Amazon Gift Card!! That mac and cheese looks so yummy! I love that Barilla doesn’t taste grainy. My family won’t eat whole wheat pasta, but they’ll eat Barilla! I love the new whole grain pastas….I tried them years ago when they were dark and “grainy” and decided I’d rather do without pasta!! Use Barilla all the time. I love whole wheat pasta more than regular! The nutty flavor, al dente texture, and health properties make it a no-brainer for me! 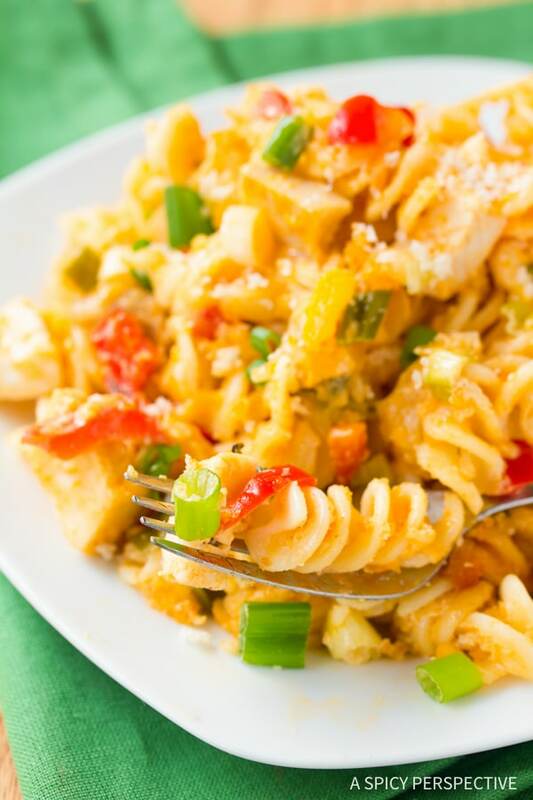 Love serving whole grain pasta to my family and it tastes great. Not sure you get how much I want this!! I usually land up making a sweet dish with these shells and now I am tempted to try this savory dish. Looks so YUM! This is something that I can easily try out. I like this pasta because it is found in most stores plus it tastes great. I’m wondering- what is the measurement for the wing sauce and the bread crumbs? I don’t recognize the symbol that is showing. This is total comfort food… while I don’t cook meat, I can completely appreciate how wonderful a dish like this can be. Looks marvelous! This looks fantastic. I love anything buffalo flavored. Holy yummy, and did you know I also made this same dish…diff ingredients but I made buffalo mac over the weekend. I used sharp cheddar and goat cheese, goat cheese taste fabulous with buffalo sauce. Your pictures are fantastic! I always have trouble getting cheesy casserole-y dishes to look pretty, but you made this stuff look amazing! I like Barilla Whole Grain because it holds up to even the thickest sauces and still tastes great! There appears to be some funky text issues with the quantities listed in the ingredients, as well as in the directions. I am reposting because my previous comment has an invalid email :( I love Barilla because it has the texture of “regular” pasta but the benefits of whole grains! I’ve really gotten into cooking with whole wheat pasta recently and I love Barilla. I’ve never tried a pasta dip and I’m excited to try it out this weekend! WHAAAAAAAAT! This looks INCREDIBLE! And I LOVE your photos!! I love that there are now whole-wheat pastas out there that actually taste good these days! I only buy Barilla pasta, and as soon as my grocery store starts carrying it, I’m definitely picking it up! Wow, that looks incredibly delicious! I love Barilla because it has the texture of “regular” pasta but the benefits of whole grains. First of all, Buffalo chicken mac and cheese is easily one of my go-to crowd-pleasing meals :) I haven’t made it for a single person who hasn’t wanted to eat the entire tray’s worth, haha. Yours looks really great, I love the simple sauce you use…no bechamel required! I actually love Barilla’s whole grain pastas. It makes me feel a lot less guilty about indulging. I often use their whole grain pastas for mac and cheese among other pasta dishes.